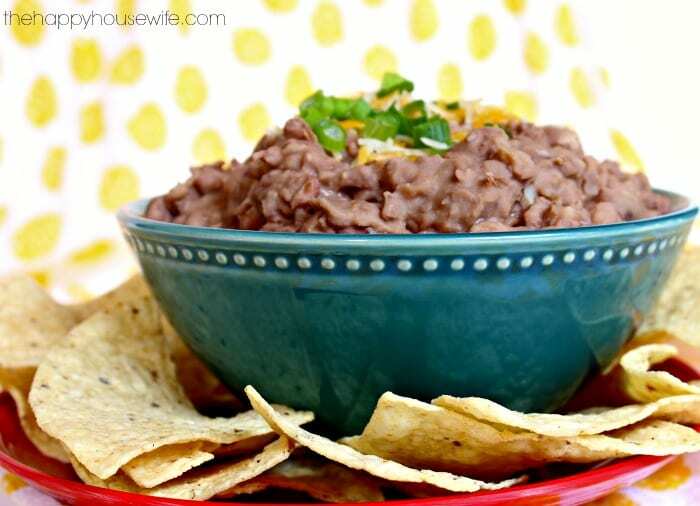 Making your own refried beans is easy and economical. 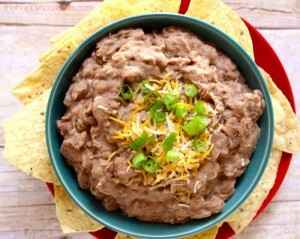 There are many uses for refried beans: bean burritos, bean tacos, beans and cheese, bean dip and more. They are inexpensive and very nutritious. Pinto beans are high in fiber, magnesium and potassium and can be purchased at any grocery store for around $1-2 a pound. 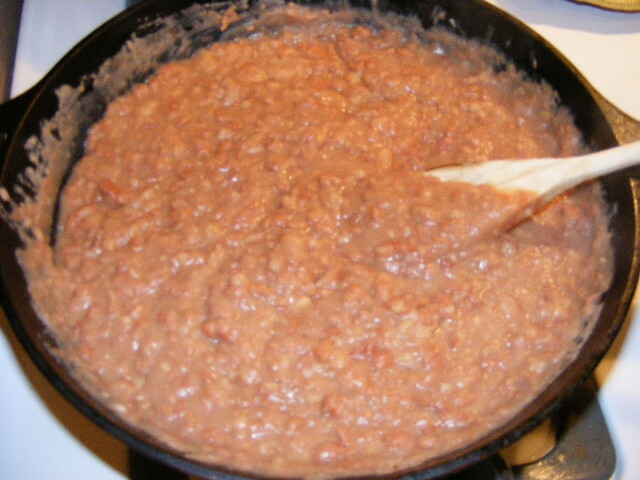 Most people purchase their refried beans pre-made in a can. While this is definitely an option, I think the homemade version tastes so much better and you can control the amount of salt in your own homemade refried beans. 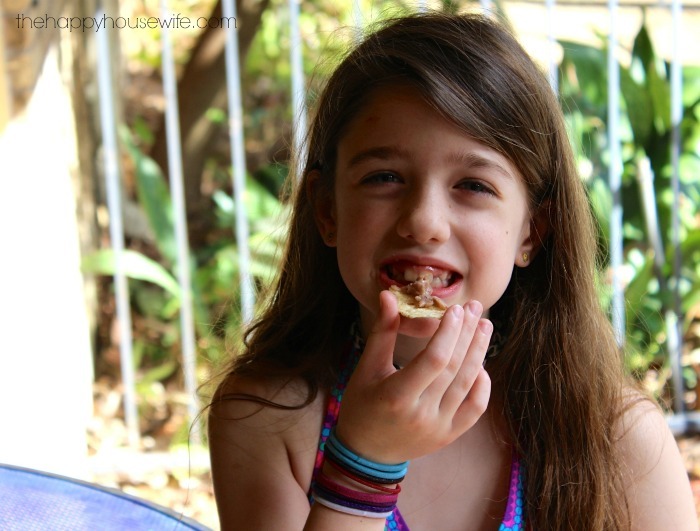 My kids absolutely love refried beans. When you make your own refried beans you can also control the amount of salt in the recipe, which is great for people on a low sodium diet. We prefer our beans with only salt and a little butter or fat added, but you can also add chopped onion and garlic to your beans to suit your taste preferences. These delicious homemade refried beans are easy to make and taste so much better than beans from a can. While you can make these beans with butter or lard, I prefer bacon grease. I feel like it gives the beans more flavor. Soak pinto beans in water all day.Cook overnight on low in a slow cooker with lots of water. In the morning, drain off most of the water and put in the fridge to cool. 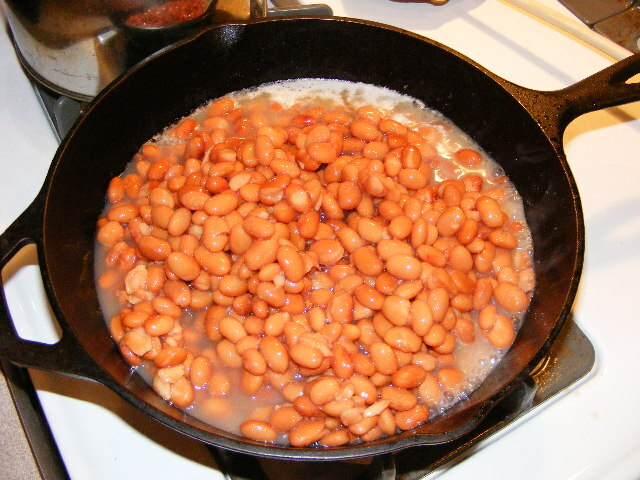 Beans should be cold before frying.Add butter or bacon grease to a frying pan. Add cold cooked beans and as much liquid from the beans as desired. The more liquid, the soupier the beans. Cook on medium heat. While beans are cooking start to mash with a potato masher. Continue mashing until desired consistency is reached. Ensure that the beans are simmering while being mashed.Add salt to taste.If beans are too runny, then cook a little longer and the liquid will boil off. Here’s a video tutorial to show you how easy it really is to make these beans! We used these beans on open tacos. This might be the quickest and easiest dinner in the world! My kids love homemade refried beans and could hardly wait for me to take some of the pictures so they could dive into the beans and cheese. 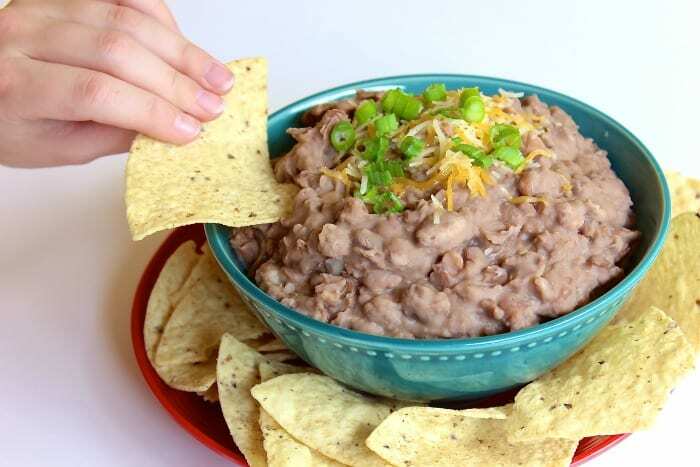 If your kids love tortilla chips, refried beans are a great way to add a high protein, high fiber twist to a typical snack food. Refried beans freeze well too! I usually freeze mine in quart size bags and which is enough for one meal. You can find more delicious meal ideas at the The Happy Housewife Recipe Index. 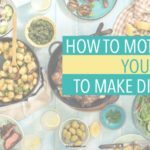 ooh I like this tip–my boys love refried beans, but I bet homemade is much healthier and maybe even cheaper! I will have to try this! Yumm I love refried beans! Thanks for sharing. I’ll have to make some of these. Of course, the saltier the better for me! I JUST purchased a bag of dried pinto beans on my last shopping trip and planned to find a recipe this week for refried beans. Great timing! Thanks! Like Amy, I just purchased some pinto beans for the purpose of making refried beans. Now I don’t have to search for a recipe! Thanks! I’m sure the pictures will help, too! I can’t wait to try this! Thanks for your clear instructions and photos! Makes me hungry they look so yummy. Do you have a preference for cooking pans? We need some new ones and I would like to find something that works well and will last a long time, but isn’t too expensive. 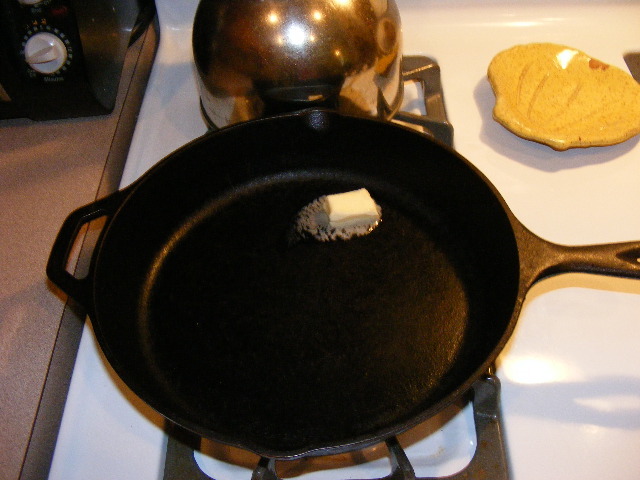 I have never tried cast iron, but am considering it. What do you use? I am just starting to get into buying dried beans, and not buying the already canned ones. Can I soak a big batch and somehow store them? I don’t want the batch to go bad before I use them…or do I just have to do it in smaller batches and keep the dried ones always dried? Thanks! You can freeze beans that have been soaked and cooked. I have never stored beans that have been soaked but not cooked. They would keep in the fridge for a day or two, but probably not longer than that. I make pot beans each week and have leftover liquid after eating the beans…can i use the bean liquid in place of water for making more beans the next day? Seems a shame to throw out flavorful nutritious liquid and start again with plain water! This is great! 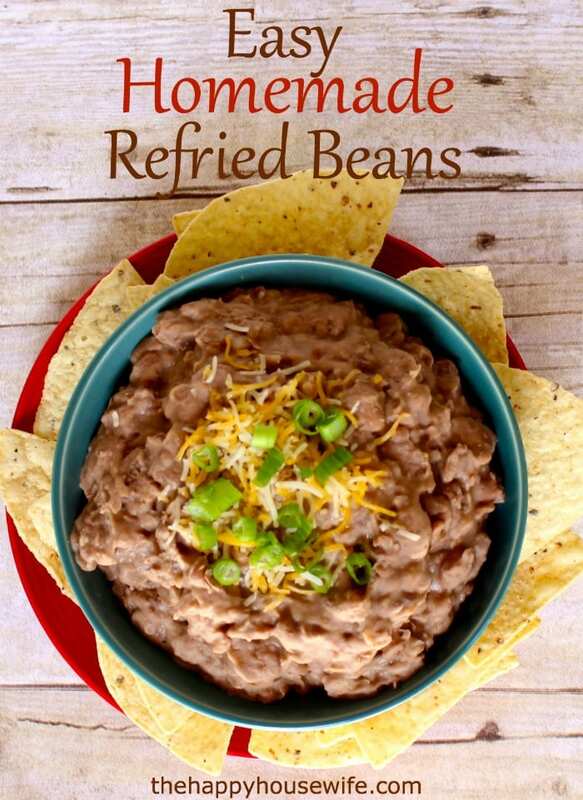 I’ve been looking for a refried bean recipe and this is perfect. Can’t wait to try this. Thanks! LOVE this recipe! I can’t wait to try it! Thank you!!! I really appreciate your recipes and I love the pictures! You are doing a great job! I have been making homemade beans all my life. Yes, they are much better for you (and tastier). Our family has been making these for years, and I just wanted to share another way of making them. 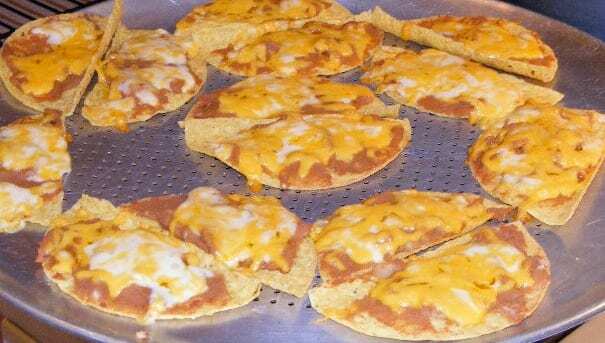 This recipe is from my Grandmother who came from Mexico. We don’t soak the beans. We just rinse the beans (to get rid of the excess dirt on them). Then we put them into a big pot and cover with water – about 1 or 1-1/2 gallons of water, depending on your size of pot. Place pot on your stove top and bring the water to a boil. Next we add one half of an onion, cut into 4 pieces. If you like the flavor of bacon, you can add one slice (uncooked) for flavoring. At this point, they are ready to eat. You can eat them whole like this – like for chili, or you can mash them as in refried beans. 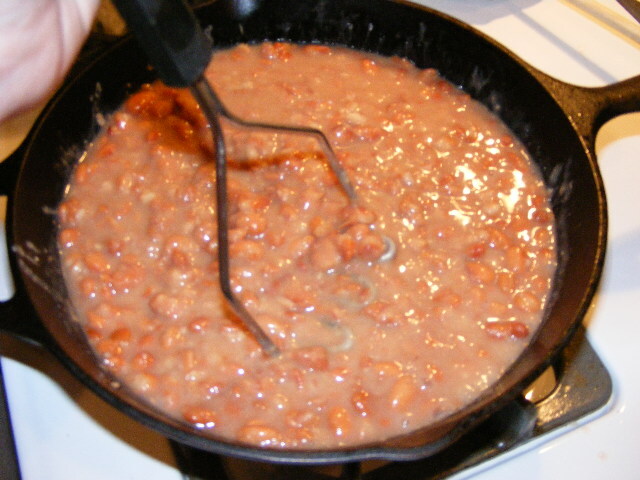 For refried beans: you can put them directly into the frying pan. I do not cool the beans. I will say that I never thought about freezing the beans after cooking, but I will give it a try! Thanks for all your tips Norine, definitely something to try! Another step that improves the beans but takes more time is to refrigerate the beans overnight after mashing them, and then cook them again, adding water until you get the consistency you want. I used to manage several taco bells long before freeze dried became the norm. We cooked a batch of beans in a giant pressure cooker, broke them down with a two foot long drill bit with a cutter on the end, poured them out in large shallow pans (so they would cool faster for food safety) and reheated them before serving. That said, the freeze dried packets available in the grocery are very very good and can save a tremendous amount of work. Just add hot water, simmer on low for 30 minutes stirring occasionally with a spatula, and serving them up. Canned or packaged cooked beans don’t even compare.